It's all about enterprise apps in the mobile development arena these days, the latest study from VisionMobile Ltd. indicates. 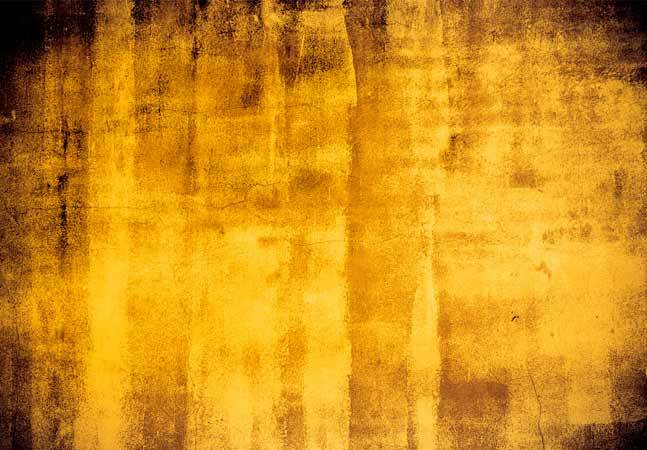 The company, which regularly conducts massive mobile developer surveys, predicted an enterprise "gold rush" in its last report six months ago and confirmed that prognostication is coming true in its latest survey, "Developer Economics Q1 2015: State of the Developer Nation." "The gold rush is underway with the number of developers primarily targeting enterprises up from 16 percent to 20 percent over the last 6 months," the survey of more than 8,000 developers said. But consumerist coders can come back, said Developer Economics authors Mark Wilcox and Christina Voskoglou in a blog post today. "The good news for consumer app developers is that three of their top five favorite categories are common with enterprise app developers," they wrote. "It's definitely not too late to refocus on B2B rather than B2C sales. Also, the skills developed building consumer apps are in greater demand than ever now that more and more businesses are taking mobility seriously. This is a trend that will keep running for several years yet." Other main takeaways in the survey include: the "unprecedented" rise of the Apple Inc. Swift programming language; a stalemate in the platform wars (between Android and iOS, with Windows Phone a distant third); strong interest in developing for the Internet of Things (IoT) -- with smart homes the top target; and increased usage of developer tools, among several others. 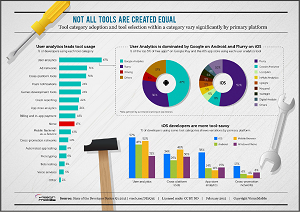 In tracking more than 900 third-party tools used by mobile developers, VisionMobile noted that their importance seems to be rising, with the percentage of respondents who reported not using any tool falling to an all-time low of 17 percent. But the report indicated usage still seems to be lagging, considering the many benefits such tools offer. "In our reports, we have consistently highlighted the correlation between tool use and various measures of success for most categories of tools," it said. 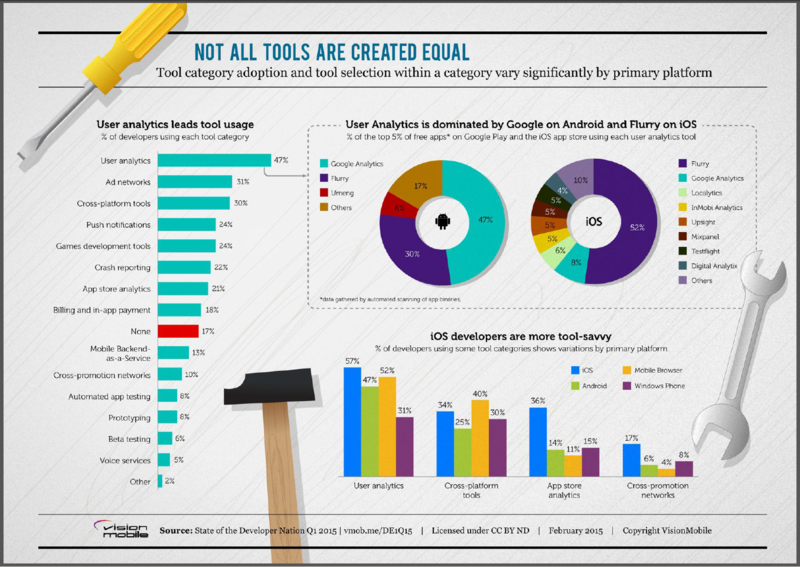 "Sadly, the other insight we see consistently in survey after survey is that developer adoption of tools is fairly low across almost all categories. For most types of tools there are options that are completely free, or at least have very generous free tiers that make them effectively free for most apps. This makes it all the more puzzling as to why more tools aren't used. Is it lack of awareness?" The top tool categories are user analytics, ad networks and cross-platform tools. "The percentage of developers using cross-platform tools has grown from 23 percent to 30 percent over the last six months," the report stated. "Unsurprisingly, developers who prioritize the mobile browser are the most likely to adopt cross-platform tools in order to leverage their Web skills building hybrid apps. Xamarin is also increasing in popularity as C# developers need to reach users on iOS and Android. Both Web hybrid approaches and Xamarin are increasingly popular with enterprise-focused developers." VisionMobile seemed to be the most surprised by the rapid ascent of the Swift programming language introduced last year as an option to traditional Objective-C coding for the iOS platform. "Our survey of 8,000-plus developers ran just four months after Swift was introduced to the world and only one month after it was possible to submit an app written with it to the iOS App Store," the report said. "With this background it's fair to say that adoption levels are totally unprecedented. 20 percent of all mobile developers were using Swift and 2 percent as their primary language. For a language that's still evolving and for which the tools are not yet mature (Apple just released an updated compiler that crashes a lot less), this is highly remarkable."